Product #1250 | SKU EF85LUSM | 5.0 (based on 2 ratings) Thanks for your rating! High-performance lens great for portraits and wedding photography. 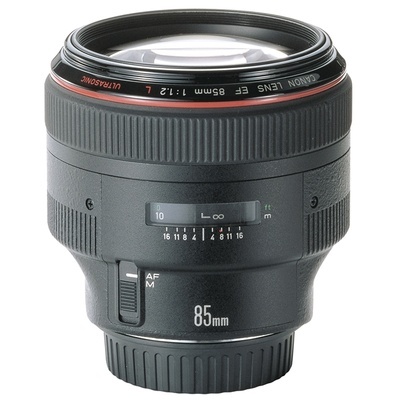 The Canon EF 85mm f/1.2L II USM Autofocus Lens is a fast lens that delivers superb optical performance. A maximum aperture of f/1.2 makes it the professional's choice for shooting without flash in low light conditions. The large aperture also provides fine control over depth of field for compelling portrait photography. The ring USM uses ultrasonic frequency vibrations to drive extremely rapid auto focus with near-silent operation. A high-speed CPU and optimized AF algorithms contribute further to AF speed. Full time electronic manual focus override is available without having to switch out of AF. The circular aperture creates a shallow depth-of-field that brings attention to the subject and blurs the background, which is ideal for portraits and weddings. Big glass with great results. If it isn't on a rental job, Ashley always grabs this for her photo shoots. This is my favorite portrait lens, really really fast and great depth of field.